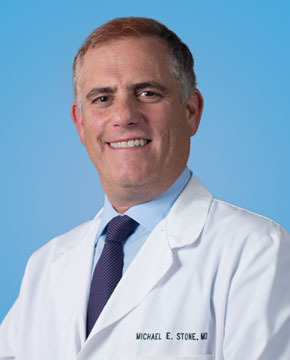 Dr. Jeffrey S. Weingarten, M.D., is an otolaryngologist at Ear, Nose and Throat ConsultantsDr. Weingarten was raised in Chicago area. He was Board Certified in Otolaryngology- Head and Neck Surgery in 1987. He has been the Section Chairman of Otolaryngology at Providence Hospital. He has also been the Chairman of the Department of Otolaryngology and Ophthalmology at Providence Hospital. He has been the Medical Director of the Providence Hospital Voice and Communications Center. He is actively involved in teaching his colleagues and students. Dr. Weingarten was awarded “Teacher of the Year” from a residency program. Dr. Weingarten has published in the medical literature. He has been a member of the American Academy of Otolaryngology- Head and Neck Surgery, the Michigan State Medical Society, and the Oakland, Macomb and Wayne County Medical Societies. He has received leadership awards from the American Academy of Otolaryngology- Head and Neck Surgery. He has been an appointed member of the Medicare Advisory Committee. Dr. Weingarten has been an Executive Board member and was President of the Michigan ENT Society. 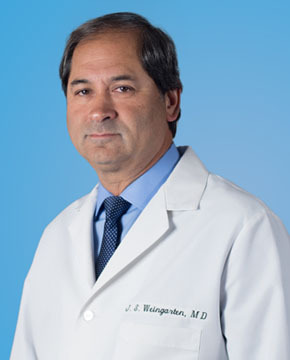 Dr. Weingarten practices all aspects of otolaryngology (ENT). He has a special interest in nose and sinus disorders, pediatrics disorders, snoring and sleep apnea surgery and voice disorders. Dr. Weingarten welcomes all inquiries about his training, skills, and areas of special interest. Dr C. Bart Dickson, MD Dr. Dickson was born and raised in southeast Michigan. He was Board Certified in Otolaryngology- Head and Neck Surgery in 1987. He has been the Section Chairman of Otolaryngology at Providence Hospital. He has also been the Chairman of the Department of Otolaryngology and Ophthalmology at Providence Hospital. He is actively involved in teaching his colleagues and students. Dr. Dickson has published in the medical literature. He has been a member of the American Academy of Otolaryngology – Head and Neck Surgery, the Michigan ENT Society the Michigan State Medical Society, and the Oakland County Medical Society. Dr. Dickson practices all aspects of otolaryngology (ENT). He has a special interest in nose and sinus disorders, pediatrics disorders, ear surgery and ENT cancer disorders. Dr. Dickson welcomes all inquiries about his training, skills, and areas of special interest. 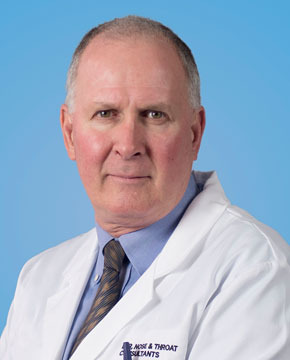 Dr. Michael E. Stone, M.D., is an otolaryngologist at Ear, Nose and Throat Consultants. 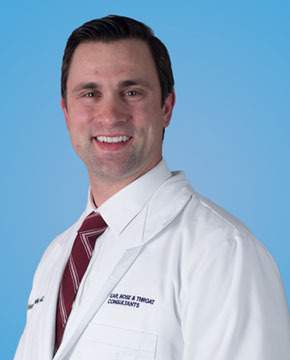 Dr. Stone was born and raised in southeast Michigan. He was Board Certified in Otolaryngology- Head and Neck Surgery in 1999. He has been the Section Chairman of Otolaryngology at Sinai-Grace Hospital. He is actively involved in teaching his colleagues and students. Dr. Stone has published in the medical literature. 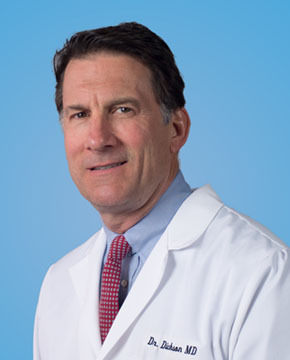 Dr. Stone has a special interest in Thyroid and Parathyroid surgeries.He has been a member of the American Academy of Otolaryngology- Head and Neck Surgery, the Michigan ENT Society, the Michigan State Medical Society, and the Oakland County Medical Society. Dr. Stone practices all aspects of otolaryngology (ENT). He has a special interest in nose and sinus disorders, pediatrics disorders, ear surgery and ENT cancer disorders. Dr. Stone welcomes all inquiries about his training, skills, and areas of special interest. Dr. Standring was raised in Chicago area. He is Board Certified in Otolaryngology/Head and Neck Surgery. He is actively involved in teaching his colleagues and students. He was awarded “Consultant of the Year” from physician residency training programs. Dr. Standring has published multiple articles and book chapters in the medical literature. He has been a member of the American Academy of Otolaryngology- Head and Neck Surgery and the Triological Society and is on the national Rules and Regulations Board. Dr. Standring has participated in multiple foreign surgical/medical mission trips including Kenya and Vietnam. Dr. Standring practices all aspects of otolaryngology (ENT). He has a special interest in ear and hearing disorders and surgery, hearing and hearing aids, nose and sinus disorders, pediatrics disorders (ear infections, tonsils and tubes), snoring and sleep apnea surgery, and voice disorders. Dr. Standring welcomes all inquiries about his training, skills, and areas of special interest. 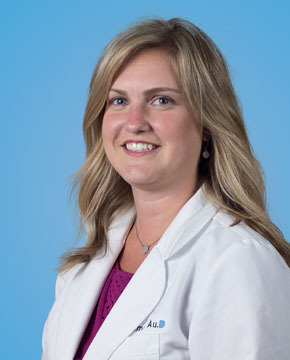 Dr. Lauren Murrill, MD was born and raised in southeast Michigan. She completed her Otolaryngology (ENT) residency training at Chicago's Loyola University Medical Center in June 2017. She is actively involved in teaching her colleagues and students. Dr. Murrill has published in the medical literature. She has been a member of the American Academy of Otolaryngology - Head and Neck Surgery and the American Academy of Otolaryngic Allergy. 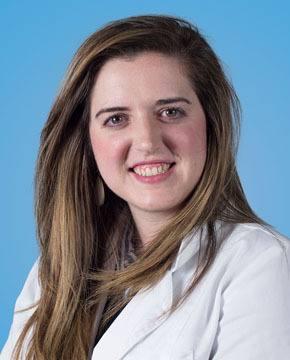 Dr. Murrill practices all aspects of adult and pediatric otolaryngology. She has a special interest in allergy disorders, nose and sinus disorders, pediatric disorders, and reconstruction of facial skin cancers. Dr. Murrill welcomes all inquiries about her training, skills, and areas of special interest. Dan O'Hara received a Masters Degree in Audiology in 1980 from Wayne State University, Detroit ,MI. Prior to that, he received his Bachelors Degree in Audiology and Speech Sciences from Michigan State University East Lansing, MI. Postgraduate, O'Hara served a postgraduate clinical Fellowship at the University of Oregon at Eugene, OR. Once returning to Michigan in 1982, and for the next 30 years, he has been working as a Clinical Audiologist in three different Ear, Nose, and Throat Clinics southeastern Michigan. O'Hara has served two terms on the Michigan Academy of Audiology Board of Directors. Also, he was one of the first Audiologists in Michigan, Licensed as a Hearing Aid Dispenser (1988), prior to the State of Michigan's Audiology Licensure law for Audiologists. O'Hara holds the Certificate of Clinical Competency through the American Speech - Language and Hearing Association (ASHA) and is a Fellow in the American Academy of Audiology ( AAA). Also, he is a long-time member of the Michigan Academy of Audiology (MAA). Today, O'Hara's clinical and rehabilitative interests and work is focused on obtaining the correct hearing instrumentation for his patients. Helping and leading his patients back into the hearing world. Understanding that hearing rehabilitation is a process. Counseling, guidance, understanding and patience from all parties involved is what makes a successful hearing aid fitting. Patricia Wilson, M.A., CCC-A, earned her Bachelor of Science degree from Western Michigan University in 1982 and her Masters degree in Audiology from Western Michigan University in 1984. 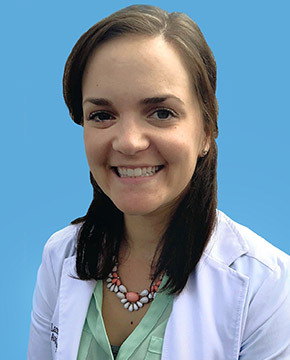 She is a member of the American Speech-Language and Hearing Association, holds her certificate of clinical competence in Audiology, and licensed in the state of Michigan. Patricia has 15 years of clinical diagnostic testing experience as well as advanced knowledge and training in the selection and fitting of digital hearing instruments. Since April of 2006 she has been employed by ENT Consultants/ Quality Hearing Aid Center working out of the Livonia office. Patricia specializes in the fitting of hearing instruments and is dedicated to helping individuals overcome their hearing difficulties through amplification. Patricia also believes that an informed and educated patient is best and works to get patients to understand their hearing disability as well as their hearing aids. Kristeen Thompson received her Doctor of Audiology degree from Salus University in 2010 and her Master of Science degree in Audiology from Wayne State University in 1997. She holds her license in Audiology from the State of Michigan and her Certificate of Clinical Competence in Audiology from the American, Speech, Language, and Hearing Association. She specializes in hearing aid technology and vestibular and electrophysiology testing. Outside of work, Kristeen enjoys spending time with her family and friends, especially her two daughters and her St. Bernard, Maximus. Adrienne Johnson received her Bachelors of Art in Hearing and Speech Science from the University of Maryland College Park and her Doctorate of Audiology from Central Michigan University. She holds her license in Audiology from the State of Michigan, her Certificate of Clinical Competency in Audiology from the American Speech, Language, and Hearing Association, and is a Fellow of the American Academy of Audiology. Dr. Johnson specializes in hearing aid technology as well as vestibular and electrophysiology testing. She takes a special interest in educating her patients on how the whole body can be influenced by hearing ability. Lisa Simon received her Doctor of Audiology degree from Wayne State University and her Bachelor of Science degree fromGrand Valley State University. Dr. Simon completed her Audiology Externship at Henry Ford Hospital in Detroit, Michigan. She is aFellow of the American Academy of Audiology and holds her license in Audiology from the State of Michigan. She has experience in a variety of clinical settings including diagnostic testing for adults and children, comprehensive hearing aid services, and vestibular testing. She has a special interest in electrophysiology and advanced hearing aid technology. 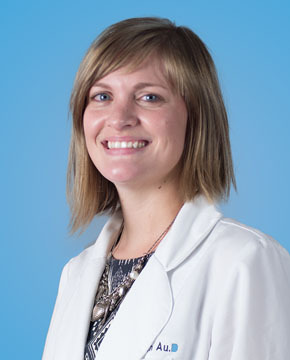 Dr. Simon enjoys the constantly evolving field of audiology and the relationships she develops with her patients. Outside of work Dr. Simon enjoys spending time with her husband and dog named Louie, playing soccer, cooking and gardening. Maggie Leonards received her Doctorate of Audiology from Wayne State University and her Bachelor of Science from Purdue University. Dr. Leonards, completed her Audiology Externship at Kaiser Permanente in San Francisco, California. She is a fellow of the American Academy of Audiology and holds her license in Audiology from the State of Michigan. She has experience in comprehensive audiologic evaluation, electrophysiology, vestibular evaluation, and rehabilitation for all ages. 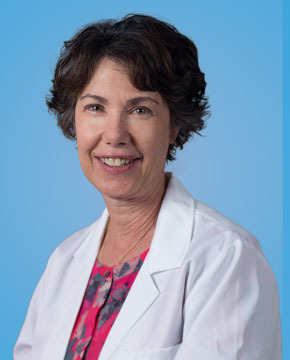 Dr. Leonards is committed to serving her patients and providing optimal hearing healthcare. April Crovak received a Doctor of Audiology degree in 2016 and a Bachelor of Arts with a major in Communication Sciences and Disorders in 2012 from Wayne State University. 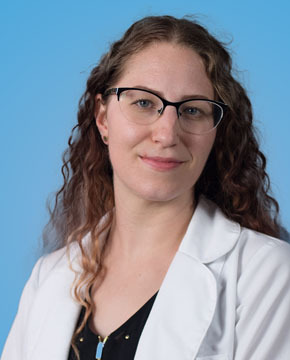 Dr. Crovak completed a doctoral externship at Charlotte Eye Ear Nose & Throat Associates, PA where she practiced electrophysiology, cochlear implants, pediatrics, and auditory rehabilitation. 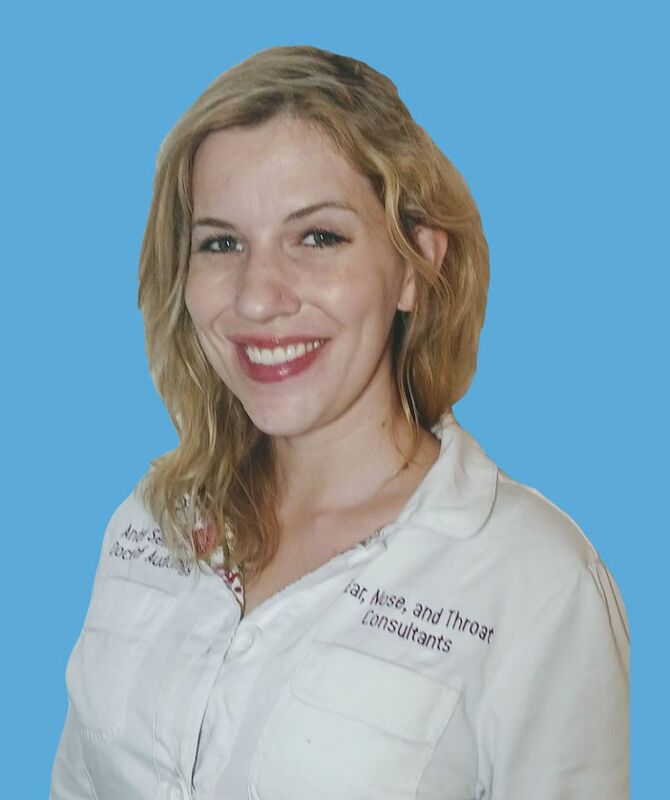 Her passion lies within educating patients about hearing loss and bringing them through the auditory rehabilitation process. 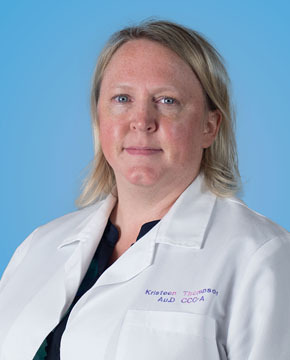 In her free time, Dr. Crovak enjoys playing guitar, going to concerts, and watching documentaries. Dr. Seker earned her Doctorate in Audiology in 2008 from Purdue University. She graduated from the Ohio State University in 2004 with a Bachelor of Arts in Speech and Hearing Science; Linguistics; and French. Dr. Seker is a Fellow of the American Academy of Audiology and is licensed in both Michigan and Ohio. She has a special interest in age-related hearing loss, tinnitus, decreased sound tolerance, and assistive listening devices. She also has extensive experience in testing and treating the pediatric population. 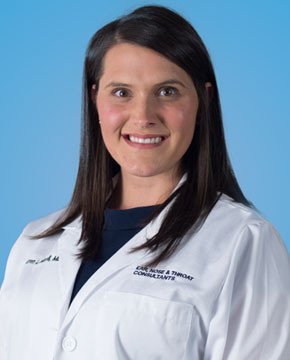 Dr. Seker believes in patient education and advocacy, and strives to provide the best care to her patients. In her spare, time she enjoys keeping up with her two energetic boys, gardening, reading, kayaking, and hiking. Dr. Larson received her Doctorate of Audiology from Rush University and her Bachelor of Arts from the Ohio State University. She completed her Audiology Externship at MetroHealth Medical Center in Cleveland, Ohio. She is a fellow of the American Academy of Audiology and holds her license in Audiology from the State of Michigan. Dr. Larson enjoys working with patients with hearing loss and their families to determine the best solution for their unique needs. In her free time she enjoys running, hiking, and spending time with her two dogs, Dobby and Sophia.